A “Business Walk” is a day dedicated to learning more about your local businesses through face-to-face interviews on their turf. Local leaders visit each business with the hopes of gathering the knowledge that they need to help their community and strengthen relationships. The “walk” can also be a celebration of local businesses—corresponding to an existing celebration or as a new event. UW Extension-Grant County then uses the responses to those interviews to generate a simple, easy-to-read report that decision makers can use to help strengthen their local businesses. To understand the issues facing your business community. To build working relationships between decision makers and local businesses. To celebrate and promote your local businesses. To provide local businesses with educational resources. This program is based off of other successful Business Walks from communities in other parts of the United States and Canada. The (3) primary questions are based from other Business Walks programs while the (7) secondary questions are based on the University of Minnesota’s Business Retention & Expansion survey instrument. Both programs were proposed at the 2012 IEDC Business Retention & Expansion Training Event in Vancouver, B.C. In addition, local business leaders and Chambers of Commerce participated in developing the final version of the survey instruments specific to their communities. 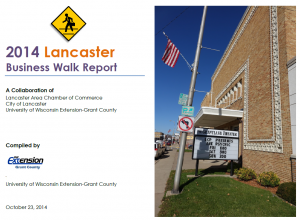 For more information regarding “Business Walk”, please contact the UW Extension-Grant County, Community Resource Agent.